The role of a driving instructor can be a rewarding career not only in terms of job satisfaction, but also financially. This page offers tips and advice for choosing the best driving instructor trainer for you. Training and potentially becoming a driving instructor on the other hand for some, can be a minefield and an impossible task at best. There isn’t ‘the best’ driving instructor training as such, as it really depends on the individual that is teaching, how they operate and what you wish to gain from it at the end. Choosing your training provider is the first important step. Try and ignore all the advertisements and sales talk promising huge earnings for little outlay as the wrong decision can leave you with poor training and severely out of pocket financially. Any fully qualified driving instructor can be a trainer. National instructor trainers are likely to be ORDIT (Official Register of Driving Instructor Training) registered. Being ORDIT registered means that a certain standard of training must be complied with which is set by the DVSA (Driver and Vehicle Standards Agency) terms and conditions. Choosing a ORDIT registered trainer offers you piece of mind that you can expect a certain level of quality, although it certainly doesn’t mean that it will be better training than trainer that is not ORDIT registered. Some may find the prospect of self-training daunting or perhaps lack the motivation needed to get yourself through. If this is the case, you may well find that a national company will offer the best driving instructor training for you. A national instructor trainer will have you in groups. This may help with any lack of motivation and because of the initial financial outlay, should motivate you further to succeed. If you intend to join a national driving school once you have completed their training, many offer a discount from the training offered. This would however likely be tied in with a contract. If finances are an issues, choosing the independent route could be the way to go. An independent trainer may offer a pay-as-you-go option allowing you to come and go as you please. As there is no initial financial outlay, this also offers you the option to leave if you feel their services are not up to standard. If you feel that the normal theory test for learner drivers is easy, you may study for the Part 1 test yourself as it is similar. This will instantly reduce your training fees. Training books are available as are tips for passing your theory test for learner drivers. These tips may also help for your Part 1. The amount of training for the Part 2 test will generally depend on the current standard of your driving. If your current standard of driving is good, then only a few driving lessons may be required to pass the Part 2 test, again making you savings. It is worth mentioning however that the Part 2 training is the most important training you will receive to become a qualified ADI. A good instructor trainer shouldn’t simply focus on the standard of your driving. Many elements of the Part 3 training should be integrated into Part 2 training. Certainly savings can be made for the Part 1 test and to a degree, the Part 2 test. The Part 3 test however will require a full, structured and professional course, that ideally should have started during your Part 2 training. Apart from the financial saving that can be made from choosing an independent trainer, the personal and one-to-one training can also be favorable. Much of a national trainers time will be spent sharing cars and lesson time with other trainees. Although this does offer you the ability to observe others and the mistakes they make, it is often noted that not enough one-to-one training is given. A potential disadvantage of a national driving instructor trainer over an independent driving instructor trainer are training schedules. A national provider is likely to use set schedules for training where as an independent is likely to allow training sessions that suite you. Many qualified driving instructor will state that the best driving instructor training comes from the independents, being a smaller and more personal company. Having a good knowledge of the local area and test routes is certainly an advantage. A local independent trainer is likely to convey this knowledge to you through personal experience gained over time. It can be difficult finding a trainer that you know for certain is good. It can also be quite a concern if you intend on paying the entire fee up-front. To try and find the best driving instructor training, look for reviews and opinions online in particular if you are thinking of choosing a national school. Compare it with opinions of those that have chosen an independent trainer. If you intend on seeking a independent trainer, ask instructors in your area who they trained with. A good review or opinion goes a long way. Look for opinions and advice on internet forums. 3 tests will need to be passed in order from Part 1 to Part 3 to become a fully qualified driving instructor. This test is similar to that of the normal theory test for learner drivers. The Part 1 test however, requires that you answer 100 questions in 90 minutes. 4 subject areas are involved where 20 out of 25 questions must be answered correctly in order to pass. Again, similar to the learner driver test, the hazard perception part requires that you score 57 points out of a possible 75 to pass. 14 video clips are played where at least 1 developing hazard will feature. Many similarities can be made to the learner driver practical driving test. Part 2 is taken over 1 hour test duration, will involve demonstrating more manoeuvres than the standard learner test and will feature a more diverse road conditions. 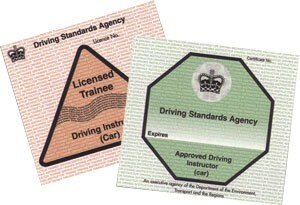 6 minors are permitted compared to 15 on the standard learner test. Your ability to teach. Test last 1 hour and is divided into two 30 minute sessions. Each session must be passed with a minimum score of 4 (up to 6). Each 2 sessions have 1 per-set test which is chosen by the examiner. The first session will feature you teaching a novice driver, the second session will feature you having to teach a more advanced driver.